The general aim of this course is to improve your Latin reading and comprehension skills and to expose you to a variety of texts in Latin. The specific goal of the course this semester is to read the lectiones from Disce!. Class will meet about 50 minutes per week. During this time we will translate, discuss and interpret the assigned readings. You are expected to come prepared to every class. Preparation means review of the reading from last class and work on the reading for the next class. You are expected to complete a Latin composition, an assignment on meter (when appropriate) and a mid-course evaluation. Failure to complete any of these assignments may significantly affect your grade in the course. Your course grade will be based upon your daily class performance and upon an ORAL final examination. You can request a verbal evaluation of your performance at any time during the term. In general, you will be graded in this course based upon the "3 P's" of PREPARATION, PARTICIPATION, and PROGRESS. Students are advised not to purchase used textbooks with writing in them. You need only Vol. 2. 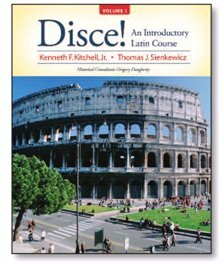 It is highly recommended that students also have their own Latin dictionaries and a Latin reference grammar. Students enrolled in LATN240/340/440 should also consult the list of required texts for CLAS/HIST240. This webpage was prepared by Professor Thomas J. Sienkewicz of Monmouth College. If you have any questions, you can contact him at toms@monm.edu.